Getting married? Know someone who is? Do-it-yourself wedding websites offer great resources and ideas for customizing a wedding and saving money on favors, invitations and wedding party gifts. 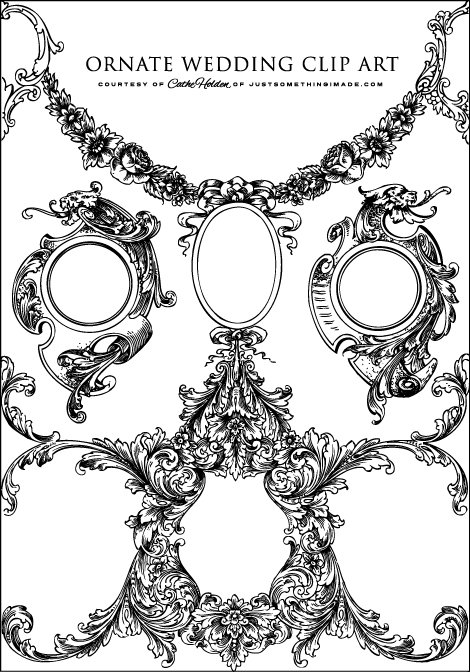 To make the wedding even more personalized, I’ve teamed up with WorldLabel.com again to bring you some beautiful free printable vintage-theme wedding designs & templates created from antique engraver’s artwork. On the WorldLabel.com blog, you’ll find inspirational photos, and free customizable download templates to print to their various label products, including full sheet, address, circle and CD labels. I’ve designed them in several colors or you can modify the colors to suit your wedding theme. 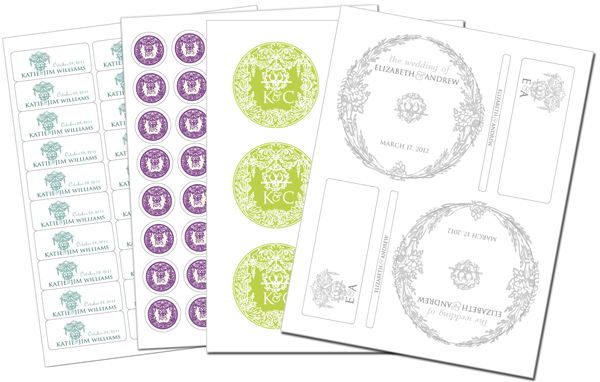 Click HERE to access multiple free wedding label downloads from WorldLabel.com. 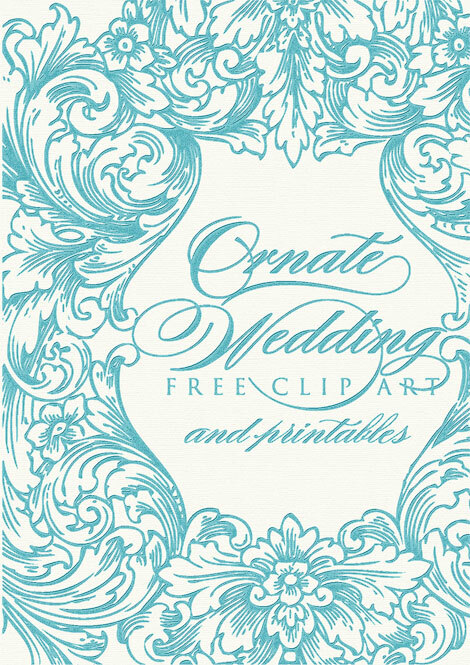 This entry was posted in Free Clip Art, Free digital downloads, Free PDF files, free vintage art, Paper Crafts, party favors, Printables, Uncategorized, Vintage blank labels, Wedding, WorldLabel.com and tagged Wedding, WorldLabel.com. Bookmark the permalink. oh, god. i want to follow you around and learn something. these are so pretty i might need to get married all over again. xow. Amazingly beautiful and so kind of you to share!! 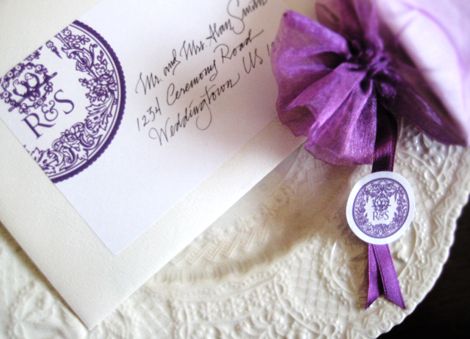 What is the font name you used on the envelope? The initials are in TRAJAN. The address is my handlettering. The Ampersand “&” is part of the artwork I modified. Cathe, those are brilliant, it almost makes me want to get married…. I will send the link to a friend who just got engaged, she might love these! BTW, I modpodged a dress form a few months back, quite like one you did a long time ago, come take a look on my blog, it turned out great. Thanks for all your inspiration too! Thank you Cathe these are beautiful and so are you to make these available to everyone. amazing work as usual. Oh So Beautiful!!! Having a Tea Party and going to use these designs for the invites!!! Thank you for helping to make my party absolutely beautiful!!! It’s all in the details! Oh thank you Cathe. when I commented before I didn’t even know you had used Katie & Jim’s names!!!! Now I do and thank you even more! Gorgeous!!! Thank you, Thank you!!! Cathe, thanks so much for all of the goodies! One thing, though, I am getting the same image (for both) when I download the last two offerings… Thank you! Just fixed it, sorry for the trouble. Let me know if you are still having the same problem with it. So sorry, my fault. It’s fixed now. Thank you for letting me know!! Thank you. These are simply fabulous! 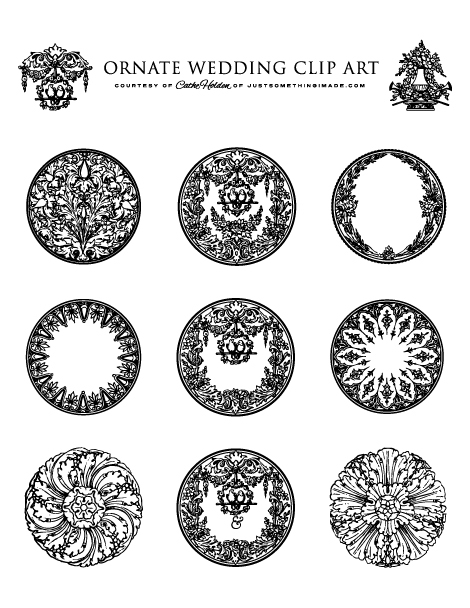 I just love your free printables…these are absolutely gorgeous! Thanks! You are so amazing!!! Thank you for sharing your wonderful ideas and of course, free things:) I love reading your blog, your creative mind inspires me! Beautiful work, Cathe! Thank you. Thank you for those lovely printables. It’s very generous of you. sooo cute…love it!! Many THANKS!!! These are fabulous, I love vintage swirls and border designs, it’s amazing people actually made these by hand hundreds of years ago. These are stuning! Thank you your generosity! Your website is awesome! Thank you for the great freebies! Hi Cathe, thanks for those wonderful templates!! Where can I find the template you use for the cd? I downloaded the round tags, modified by adding the initials. It all seemed simple enough, but…. When I went to print them there is a “Plus Symbol” that appears just right of the second inital. I can’t remove it. When I hoover over it it says, “text box”Can you tell me how to make that no show? Thanks so much… the wedding is Saturday, and I was trying to get the favors done and wrapped up by Thursday. October 18. Hi, I am just wondering if you sell CD’s with Clipart on it so that I can make some wedding invitations. I am finding it hard to find a CD that I can buy with all the clipart I need. I live in Australia, so how long and how much would it cost me if you do have a CD I am looking for. Hi Cathe Thanks sooo much it is so pretty. my son is getting married next year in March and I was looking for something like this as i wil be making the invites. Thanks so much for sharing. I am using these for my wedding and have managed to make my welcome bags and letters, invites and ceremony programs with these. They look awesome and one of a kind!!! I went to world label link and downloaded both the silver and purple templates. 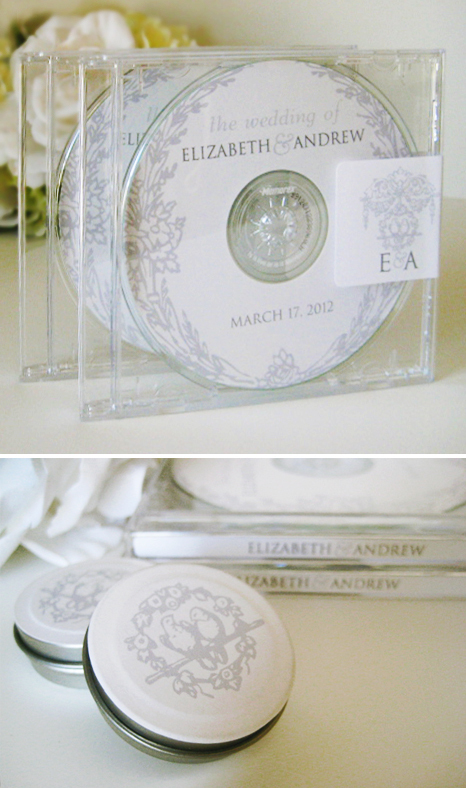 I am excited to use these at my wedding in July for our favors but neither zip file included the CD label template. Is there anyway I could get these from you or through a different location online? CD’s & DVD’s maybe going out of favour with some people, but I still see these beautiful designs being used time and time again.